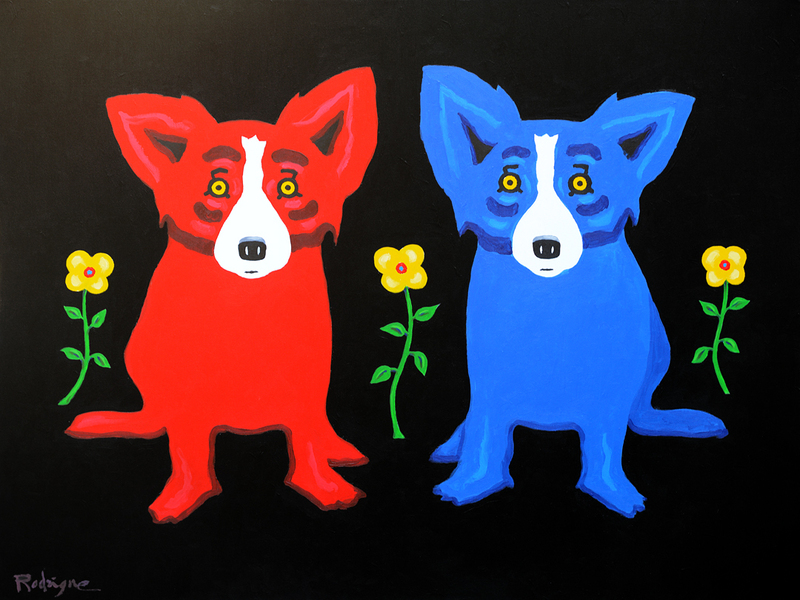 In Carmel Valley, George Rodrigue and I live surrounded by flowers. Annuals flourish here, and for the first time in years, we’re on the West Coast long enough for me to not only plant, but also nurture. Our rose garden rewarded us immediately for this bit of attention; the hollyhocks, a passion leftover from my childhood, threaten to bloom at any moment; the hummingbirds hover in disbelief as I water the long-neglected geraniums, and the deer, salivating, stare through the garden gate. These flowers thrive in a tiny fenced-in area behind our house, the only place inaccessible to Bambi. They also thrive within vases throughout the house, complementing the artwork, no matter what the flower, color, or artist. Recently, in fact, I found jewel-toned royal blue orchids at our California grocery store, impossible to resist, and now extending, appropriately, into the air of Blue Wendy. In the front yard, just outside of his studio, George encourages the deer. Although we don’t dare feed them for fear of wood rats, we quench their thirst from a fountain, a mound of granite topped with a now freshly-polished bronze sun. Without fences, the deer visit several times each day for water. While I care for the back, George loves this area because it borders his studio. He fills it with palms and evergreens, resistible to the animals. From his easel, he watches them, and they watch him. 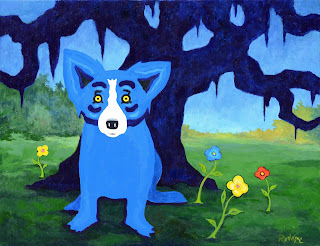 We chose this property more than a decade ago because of its lace oak groves, so similar to Louisiana’s live oaks, the trees that called George Rodrigue home from California and art school some forty-five years ago. Yet in recent years it’s been difficult for us to spend much time here. Now, with the West Coast firm in our long-term plans, we adopt this land, or let it adopt us, embracing the California lace oaks as though Evangeline herself wept beneath them. Last week we pruned the trees for the first time in five years. Oh they’re beautiful, I whispered, when George asked me what I thought about the trimming. In recent paintings, George often adds a single or several flowers to a Louisiana landscape. 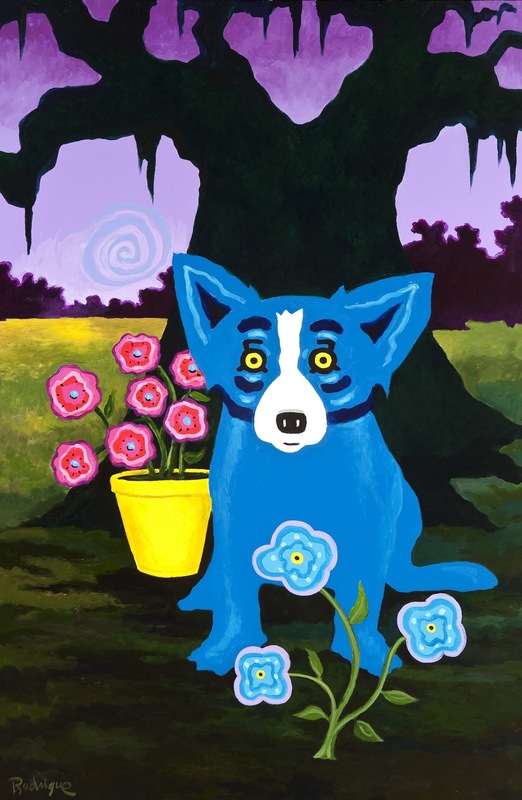 He uses flowers as design elements vying for attention with the Blue Dog. I asked him about this unnatural feature, inserted as if for balance and color patterns. Always okay in my book, but is there something more? Flourish! 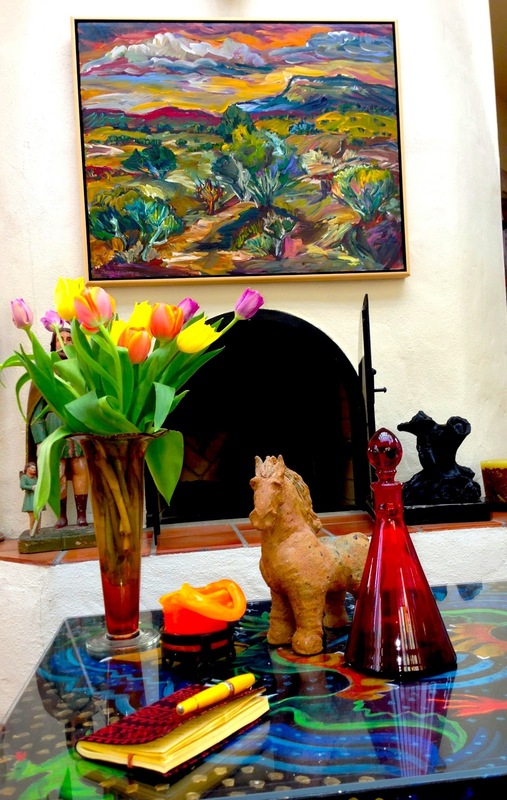 Flowers and you flourish in California! And here we are in New Orleans, where we're surprised that the gardenias and oleanders pop out, as if they've gasped and choked into being. I'm glad you always come back, because our dark oak trees make you both flourish, too. Gotta have contrast! So true about the contrast, Patty. Living in one place renews our love for the other. And by the way, I planted gardenias this year too, a recommended indoor flower in this Carmel fog, and yet they are blooming to beat the band! Oh the fauna and the flora and the California aura. Kind of irresistible, isn't it? Seems the flora part has multiplied and how beautiful it must look. Inspirational grounds never cease to tire. Yes Barbie, totally irresistible! I am planting shade-loving trailers in our grotto-like rocks this weekend! I can't wait to see all the flowers! My beds are still barren, and the mosquitos are already out in full force. Oh well, I'll just enjoy yours! So glad to see you enjoying my hometown. 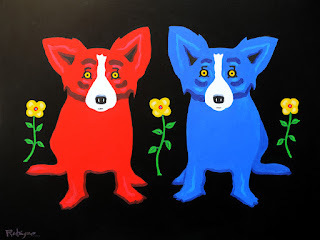 In fact,the Carmel gallery was where I purchased my first Blue Dog and, also, coincidentally, met you, Wendy, before you were the artist's wife. I hope George is inspired by the beauty of the Monterey Peninsula and "the valley" as we called it growing up. my favorite is your flowers bring me luck! A classic silkscreen. Thank you for the reminder. I love that one too! Thank you, Dawn! George and I over-the-moon about his Opus award. There is nothing as meaningful as this sort of recognition at home. Thank you for your support of the Ogden and for helping to make this happen. We're in California now, but rest assured, we'll be in New Orleans for this honored, celebratory, and HUMBLING event, as it is something George never expected. George, myself, and his sons are all truly touched. Enjoy your summer!